Cru Juliénas "Roche Bleue" and "Les Mouilles"
The Cru Juliénas est is a rich, dark wine. 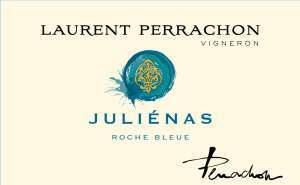 We proudly present two Juliénas, made with grapes from two different domains: the "Roches Bleues" comes from Château de la Bottière. Those wines have received numerous prizes and awards. Both have been appreciated in the Parker Guide (86/100 and 88/100), the Wine Spectator and many reference French guides such as the Hachette Guide. 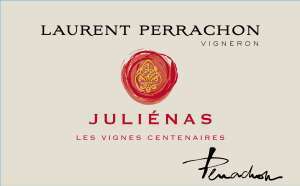 Discover also our two Special Cuvee Juliénas "Vignes Centenaires" with grapes from 100 year old vines and "L'Irrésistible"
This vigourous wine has an intense ruby hue. Produced on a clay soil, its bouquet is dominated by fruit aromas peach, red fruit and flowers. Serve at 13°C, with coq au vin, game birds or poultry en sauce. Ruby red hue, very constant with aromas of red fruits, peony and violet. The pleasant and fruity mouthfeel presents flexible and well rounded tannins. Serve at 13° C, with coq au vin, game birds or poultry en sauce. Can be drunk after 4 to 5 years but will age 10 years or more when stored in proper conditions. 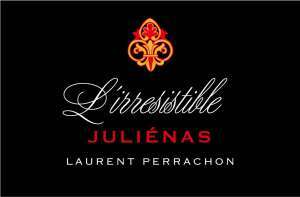 From a careful selection of our best grapes on the best terroirs of Beaujolais, the Irrésistible is produced in very limited amount: 1333 bottles only, all individually numbered. Its purple hue is dark and superb. Its very expressive nose hints of ripened dark berries. Round, powerful, concentrated, smooth tannins. A remarquable harmony. A wine of character to appreciate with a delicate meat like a farm raised limousin veal sauté. Raised for 12 months demis muids (500 liter barrels).